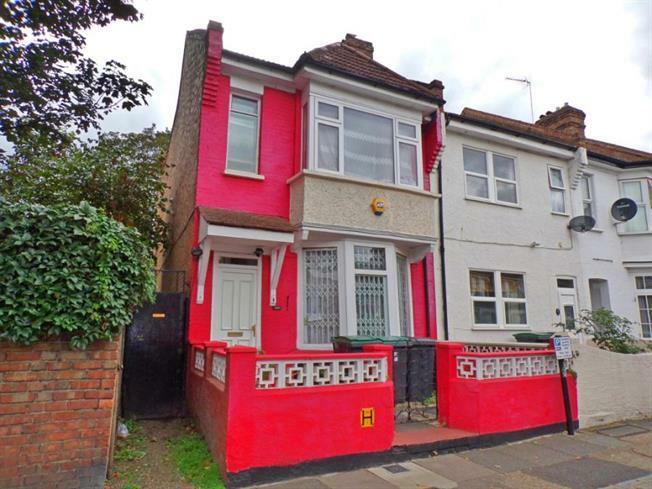 3 Bedroom End of Terrace House For Sale in London for Asking Price £565,000. Benefits include freehold, end terrace, double reception rooms, no onward chain, upstairs bathroom, bay window, side access to rear garden. Double glazed bay window facing the front overlooking the garden. Radiator, carpeted flooring. Double glazed window facing the side overlooking the garden. Radiator, vinyl flooring. Granite effect work surface, fitted units, stainless steel sink, space for oven, overhead extractor, space for washing machine. Double glazed window facing the rear overlooking the garden. Low level WC. Single shower, window overlooking the rear garden, access to rear garden. Double bedroom; double glazed bay window facing the front overlooking the garden. Radiator, engineered wood and carpeted flooring. Double glazed window facing the side overlooking the garden. Low level WC. Double glazed window facing the side overlooking the garden. Carpeted flooring. Panelled bath with mixer tap, pedestal sink with mixer tap.